Your belt is with you every time you train and every time you compete. If you take pride in the rank you've earned, why not wear the highest quality belt? These belts are sturdy without being too thick and have a unique white embroidery. Normally one end of BJJ belts are plain, but these feature embroidered Japanese kanji (reading "Jiu Jitsu"). 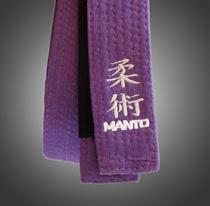 Email your friend about the Manto Brazilian Jiu Jitsu Embroidered Belts. Ask a question about the Manto Brazilian Jiu Jitsu Embroidered Belts.